Phoenix Landing hosted a very special guest, Ms. Patricia Sund! She presented another seminar in our Nourish to Flourish series, called Chop Chop! Patricia has been creating Chop for many years and taught us how to master it. Chop is a feeding concept. How many parrot owners chop fresh veggies each morning and evening? I know I do and it take so much time each day. However, as a parrot owner I want to provide the best possible diet to my feathered friends as possible. Chop is the way to go! There is no recipe!! You purchase fresh, seasonal, vegetables and greens that are available the time of year you make Chop. Purchase organic when you can and check the dirty dozen list each year and make sure you purchase those items on the list in organic when possible. Once all your ingredients are washed, dried, cooked, chopped, you mix them well and place in Ziploc baggies and freeze. Make one baggie for each day. Depending on the number and size of your parrots will depend on the size of bag you should use. This list could go on and go!! For more information about Chop and to see instructional videos, please visit http://www.parrotnation.com. The Phoenix Landing cookbook has more information about Chop and other recipes for our feathered friends. The cookbook can be purchased at PL events or on our website at http://www.phoenixlanding.org/books.html. Good luck with your first batch of CHOP! This entry was posted in Classes and Events, Parrot Education. Bookmark the permalink. I made my first batch of Chop last night. Since my flock is larger than most, I used a quart size bag. I spent about $70 on mostly organic food and got 26 quart out of it. That’s almost a month’s worth of breakfast for my birds! I jumped into CHOP this past weekend. Some foods from supermarket, some from organic store. I used my clean sink as the mixing bowl. I only have a mini food processer so it took a while but once I got everything cut to the right size it went pretty quick. I did about 60 snack bags. I only have 3 to feed. I seperated the entire CHOP into 4 and added different seasonings for a variety of flavors. It helped me use up some partial packs of Quinoa, fennel, anise, oregano, parsley. I saw them picking through for their favorites but am confident they will consume a wide variety of nutrition they need. Thank you Pat. She is like watching an energizer bunny! 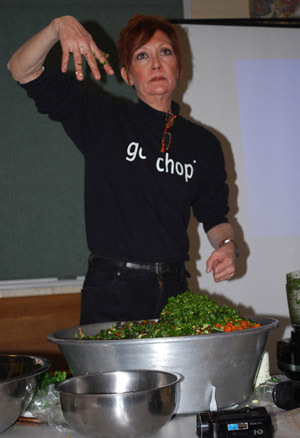 I am delighted that you posted notes from the CHOP CHOP seminar. I was unable to attend and really wanted to learn about this. I have to cut veggies for 2 guinea pigs also so will need to make sure that I use foods that my conure, cockatiel and piggies can all eat. My dogs also like to snack on the pieces that drop. Whatever is left over the chickens get the next day. Thank you for sharing. Many of us don’t live close to the seminar locations. I encourage you to post other such seminar notes that are good for all to know and supplement the core adoption qualifying ones. Are you feeding this as an addition to bird chow (Harrisons/Zupreem) or instead of? This just replaces their fresh veggies. You still need to add fruit, protein if you didn’t include quinoa in your chop and of course pellets. I started making chop a couple weeks ago for my Green Cheek Conure. Since he’s my only bird, and small, I don’t need to make much. When I chop veggies for my family, I just include a few extra pieces and chop them up very fine. I’ll put in some quinoa left over from dinner or brown rice (I even chop it up a little finer). I spread my mix on a small cookie sheet and freeze it. Then I put it in a small freezer container. When I’m ready to feed it to Taco (twice a day), I use a plastic spoon with about 1/2 tsp of Chop on it and let it sit out a few minutes to thaw before feeding. Taco thinks Mom is the greatest! I’ve started growing some herbs to add to the mix (and my dinner) and Taco gets fresh from the garden finely chopped tomatoes and bell peppers too!